Temple, is guilty of its destruction. - Then this Road, Yes, conducts to the Temple! Construction of a ship-canal in Israel. When Supreme bequeathed Erez - Israel to Jews, It has named their selected people, having assigned that the huge responsibility on this People. It has ordered to learn a Torah and to observe traditions. But to study-does not mean continuously to read and cram by heart, so to apply according to studied. The Creator could not, having named People the Selected works to code it on eternal, stupidly repeated day by day, from year to year, from century to century, - citing of texts with what they sacred were, criticizing his and to jeers of all nations of the world. Having granted the ground of Israel to Jews, It knew, that, not looking at full absence in it what or minerals, People of Israel will guess the riddle incorporated by It, and at an o'clock when the doubt will confuse all nations of the world, will prove the especial once and for all. We are obliged to make this ground prospering and - to the present rich. The rich country? Rich people, and on the contrary. It would not be desirable to be engaged in empty rhetoric, but the fact remains the fact: for prosperity of the country stable sources of incomes should be created. The country cannot plan from year to year the budget focused on the donations of world Jewry and for simplification of burden of an economic situation periodically, but with a shameful constancy, to come back to a theme of increase of taxes, or turnings of social programs. Has burst an economic crisis. The markets have failed. And clever Jewish heads can offer nothing such that will cardinally change an economic situation. The present project was born not Thoughtlessly. The author has come to it after the long analysis of materials from set of sources. Studying history of the people of Israel, getting acquainted with statements of the ancient philosophers resulted in a Torah and other sacred Books, getting acquainted with weight of great projects, including history of a birth of Suez, Corinthian, Panama channels, the decision of the riddle put in the Sacred Earth Supreme came nearer. The last, turning point to start work on the project was the thought stated by Teodor Herzel in the novel "the Earth Promised" where he has declared that there will come time when in the Jewish state even through desert the ships will go instead of camels! Leaning against the received knowledge, a wide experience of the seafarer, an economic education, I have started the project. The result of the first predesigns amazes imagination! As a result of project realization "Buildings of the navigable sea channel", the state Israel will receive in treasury Unprecedented hitherto incomes. The people of Israel will have an opportunity to work and apply the knowledge on huge space of possibilities. In the country in times the budget will increase and possibilities for weight of social programs will open. Appear unprecedented before a way of the decision of the Palestine-Israeli opposition. And after all right now, at the moment of the world crisis, at the moment of general confusion, there has come time of reconsideration of our position in the world, an exit from an economic crisis and long-term stagnation. One of economy organic laws consists that creation in the country of conditions favorable for investments; by all means conducts to those investments will not keep it waiting. And at the moment of the world economic crisis when holders huge Finances search for such, global projects, as offered here, demanding multi-billion injections, and guaranteeing return to investors of the enclosed means with profit, simply find. And to miss this, given Supreme chance, would be an inexcusable error. The organic law sane beings, - to study on good examples and not to miss the chance, and, acquiring knowledge, it is obligatory to apply them in the ability to live, to use the best efforts, to follow to the treasured purpose? To perfection, helping the people and the country with their aspiration to lifting, well-being, the world and independence! Economy - a science, in my opinion, concerning more to natural sciences, rather than to the exact sciences. At the decision-making, based on the economic analysis and exact calculations, correct preparation business - the plan, as a rule, realization of projects passes smoothly, means are spent rationally, results are visible already at the first stages of its realization. It is very important, if the considered Project, has no analogues, bears in itself considerable incomes, promotes attraction of a great number of investors and it is calculated on long time. Today, at the height of the world economic crisis, the Project offered by me, not only answers everything above listed to requirements on presence of economic preconditions, but also provides global changes in state of Israel existence. That the demonstrative base of the Civil-engineering design the Trance of the Israeli ship canal was weightier, to me it seems pertinent on this stage to acquaint all with the data about Suez Canal. Suez Canal connects Port Said on Mediterranean Sea and Suez on Red sea. Transportation of Canal connects Port Said on Mediterranean Sea and Suez on Red sea. Transportation of cargoes through the channel remains to one of the cheapest and safe ways of transportation of the goods between Europe and Asia by the sea transport. Opened for navigation in 1869 the channel long time was under control of Frenchmen and Englishmen. On July, 26th, 1956 the president of Egypt Gamal Abdel Naser declared its nationalization. Operation of this water corridor is one of the basic sources of currency receipts in the Egyptian treasury along with export of hydrocarbons, tourist sector and remittances of the Egyptians working in other countries. Now through the channel annually pass more than 30 thousand courts under flags more than 100 countries of the world. In the sum they transport about 300 million tons of various cargoes. Through the channel passes 14 % of total amount of world trade, the most part of oil transportations from area of Persian Gulf to Europe and America. In 2007-2008 financial year Suez Canal has achieved record incomes in 5 billion 113 million dollars that almost on 1 billion dollars exceeds indicators of previous years. This historical inquiry is necessary for the review of a theme - of presence exciting us, or absence, reasons on ship canal building in Israel. 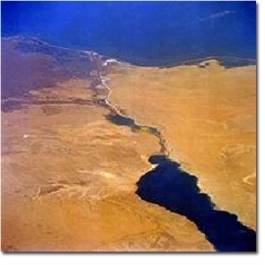 At desire digression to history of Suez Canal is easy for finding today in the Internet. As a rule, the information on it is accompanied, become already norm, boastful “Pearls” Both the writing Egyptian press and echoing those mass-media of the different, interested countries. Any information on the channel is accompanied by references on”A revolution gain” And other delirium. For example: the Magazine "Al-Ahram al-Iksisadi", has reminded that the channel makes an integral part of national consciousness of Egyptians, it is identified by them with all gains of revolutions. And hardly someone undertook to approach to studying of history of Suez canal dazzling with malicious infringements of laws of economy and its operation critically. And after all inability of Egyptians correctly to concern to them, on the present national property, has allowed me to start development of a theme of building of a ship canal in Israel in 1999 year. Today Egyptians refer to the Economic crisis which has led to reduction in February, 2009 of a gain of Egypt from sea transportations through Suez Canal almost on 25 % in comparison with similar month of last year as 23.03.2009 has reported "France Press" referring to representatives of administration of the channel - one of the major world Sea transport arteries. According to the received information, in February the gain from operation of Suez Canal has decreased from 408 million dollars in February, 2008 to 302 million dollars in 2009 Number of the courts passing through the channel, has decreased for the same period with 1272 to 868. The volume of cargo transportation through the channel also has decreased. In February this indicator has made 53 million tons in comparison with 73 million tons in similar month of last year. To construct Suez Canal, initially, did not make special work since followed only connect among themselves three lakes and, using low district, to dig further - in the north to Mediterranean, and in the south to Red to the seas. 1.The basic engineering miscalculation: Already then and till now that fact is not provided that, passing on the marshland surrounding lakes, the channel will constantly grow, be filled with silt and to decrease on depth of the channel. Received additional inflows of sea water, the lakes connected among themselves, day by day, during all time of operation, are diluted and fill with the suspensions a canal. Instead of constructing drainage system, to strengthen coast, and to drain bogs, a worthless management of the channel, throughout 140 years spends huge means on not stopping deepening of a waterway of work. At channel Administration the fund in which 25 % of all total receipts for financing of capital works and permanent jobs on channel deepening are brought is created. However, despite allocated, not the small money resources, once deepened to 20 meter depths, depth of the channel again decreases. Today the channel management officially guarantees to seafarers depth of 13 meters that is maximum permissible for swimming of large-capacity fleet. Every year published by the International Sea Organization (IMO) notices inform on tens the ships, which have sat down on a bank, following Suez Canal. - A pilotage across Suez canal, the following from port of Said, it is carried out daily by two caravans: The first caravan goes at 23 o'clock 00 minutes, the second - at 7 o'clock 00 minutes. - Conducting across Suez Canal of the courts following from port of Suez, is carried out daily only by one caravan which 30 minutes go at 4 o'clock. All vessels which were earlier passing on the channel, should arrive to Port Said for following in the first caravan not later than 21 hours 00 minutes, in the second - not later than 4 hours 45 minutes, to request the pilot and to legalize papers on vessel pass… Etc. (“ The KUBAN STATE UNIVERSITY” Chair of anti-recessionary management, taxes and the taxation. The abstract ”Egypt in economic” Has executed by the student of 3 courses, of group 316 -Belikova A.A. –Russia-). About the services given by the Egyptian experts in conducting of foreign courts, it is possible to write novels. Till now registration of formalities for channel pass is interfaced to inconceivable red tape, mass small requisitions in mix with vandalism of the personnel rising aboard of a vessel.Their quantity is always inexplicable is great: 10-20 persons. Became norm of preparation of a vessel to pass through Suez canal when crew of the vessel, preparing to follow on the channel, welds electric welding on a deck all subjects, first of all from nonferrous metals which the so-called personnel can steal, and the senior officers of a vessel prepare a large quantity of cigarettes for a presents for the so-called experts which appetite for 140 years of work of the channel has not decreased at all. The channel should connect Mediterranean (Ashkelon) and Red (Eilat) the seas, having passed through desert Negev. The Geographical position of Israel and, accordingly, its ship canal the same as also Suez it is located in an isthmus zone between Mediterranean and Red by seas that is a determinative of reduction of a way of the courts following from Asia to Europe and America on the shortest way, on 5-9 thousand miles reducing distance, rather than to float round Africa. Long-term activity of Suez Canal, as though critically we did not concern its operation, has executed the primary goal: has involved in itself goods traffics of all Worlds. To us remains only, to construct the channel, considerably best on all technical and navigating indicators, rather than Suez. Unlike Suez Canal, the Israeli ship canal is laid in dry, frequently, to stony soil. It has huge advantage in front of Suez canal since we avoid the huge expenses connected with clearing of the channel, laid in marshland. Dissecting the Negev’s height in its lowest place (600 m over Sea line), are equal from the north-northwest on the south-southeast, further, using a natural hollow of the Dead Sea, and, fenced off from penetration into the Dead Sea a dam, the channel turns along a hollow on the south-southwest, in a direction of Eilat-city. Depth of a waterway -about 50 m.
Suez Canal was under construction per 1859-1869 picks and shovels. Level of development of the modern industry allows to conduct building of the Israeli ship canal, undoubtedly, more modern techniques, quickly, with the account of requirements of 21st century and, with prospect on 22-nd. If heads of building consider possible to conduct channel building simultaneously from 5-10 points in the shortest terms (3-5 years) it can be started in operation. of navigation in the Israeli ship canal, in comparison with Suez. Primary factor of successful operation of the Israeli channel is its size. Its throughput depends on the sizes of the channel, its width and depth of its waterway. Calculation at building of similar hydraulic engineering constructions should provide that fact that their operation is planned for ever, and should consider development of world large-capacity fleet. Unlike Egypt, we cannot admit that court deadweight (load-carrying capacity) of 300 thousand tons and more. 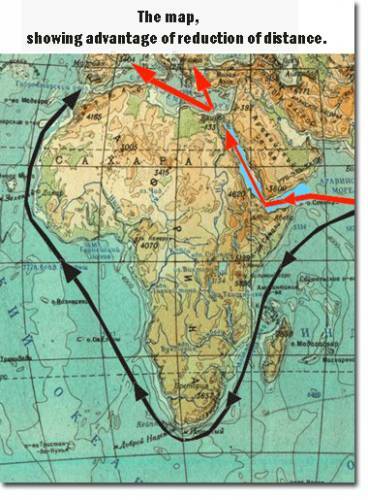 Because of impossibility of pass by Suez Canal, they follow round cape of Kind hope (round Africa). Dimensions of our channel should provide unobstructed and safe pass of large-capacity fleet. If the ships of all types can go on the Israeli channel at full speed, not strongly constrained in its width and the depth, it is the keystone to success. The sizes of the Israeli ship canal offered by me will allow ships of any type, at the approach to the channel to follow without a stop, reducing speed only for a capture aboard the pilot and representatives of boundary and customs service. The sizes of the Israeli sea ship canal allow ships not only to follow on the channel at full speed, but also in case of need to make overtaking, without fear of leaving from a waterway. by the ships of Suez and Israeli ship canals. At pass by the Israeli channel economy of time at each vessel - 10-14 hour. If to compare passableness of channels, preceding only from dimensions the Israeli variant of the channel completely will satisfy requirements of ship-owners. And consequently, it is easily possible to assume that already at the operation initial stage, the Israeli channel will allow to spend approximately 90 thousand units of fleet a year that corresponds to transportation of 4,5 billion tons of cargoes with a gain of 36 billion dollars. Through the channel will pass 25 % of total amount of world trade, the greatest part of oil transportations from area of Persian Gulf to Europe and America. But, it only a part of incomes which will be received by Israel from operation of the channel. When through our channel will pass to 20-25 % of total amount of the goods of the world and the most part of oil transportations from area of Persian Gulf to Europe and America, it is necessary to understand that the certain percent of the cargoes necessary for the country, with little effort will remain here. It is necessary to offer only the conditions favorable for investments, and foreign capitals will begin to flow in the country, as the river. What is available in view of? Egypt did not have not enough 140 years to understand that the channel and territories adjoining to it can be used not only for transfer of cargoes, and for processing going to Europe and America of cargoes. After all many of the cargoes, transported for addressees in delivery ports, there are processed in finished goods, being frequently the basic income filling budgets of these countries. As example it is served by Rotterdam, Antwerp, and Amsterdam, Hamburg. So prevents to be engaged to our country in the same? Many consignors and addressees of cargoes will be glad to reduce time of delivery of cargoes and instead of expenses to get profit on manufacture and finished goods realization a month earlier, than was earlier. Favorable conditions for investments will necessarily promote inflow of capitals, considerable quantity opening businesses, connected with processing and manufacture of a huge spectrum of the goods, to occurrence of the navigable companies which will incur delivery of small parties of cargoes to concrete addresses, is direct in ports where there are consumers. Despite the fact that Israel has outlets in all the oceans, its fleet in the port, located on the Mediterranean coast, unable to free navigation on the shortest route to the Indian and Pacific Oceans. Without the ability to "frisk" and excessive openness to the Arab world, he does not pass the Suez Canal. It cannot respond to the economic interests and national security. Not to mention the fact that a precedent was one reason for a 6-day war, when Egypt nationalized the Suez Canal, just banned the passage of Israel Float. If Israel is a channel with these dimensions, even submarines will be able to pass from the Mediterranean to the Indian Ocean, not being seen by satellites and other technical means of tracking and espionage from foreign countries. Digging a canal removed a huge amount of soil, and in its place comes water. of the channel bed and the volume of water filling the navigable channel. This amount of water can not affect the improvement of ecology once desolate and arid parts of the desert.Vaporized, the water in the form of clouds, held by mountains, in significant quantities are condensed in the atmosphere, will continue to fall as precipitation, previously absent in the area. Seeping through the earth strata, through sand, stone, clay, chalk and other components, the water will replenish underground reservoirs mineralized, filtered, almost fresh water. Vegetation along the canal will be capable of its root system to perceive the coastal moisture, which is typical for the coast all the oceans and seas. Man, however, may accelerate the planting of vegetation such an artificial way. The presence of an abundance of sunlight in this area allows the use of a vast territory for the installation of solar power and gets cheap desalination of sea water in quantities sufficient to irrigate the desert. Concerned for the replenishment of water from the Dead Sea, scientists are controlled spillway water channel near the dam. Built there station laboratory will do this in a scientifically sound mode. If the discharge from the dam into the Dead Sea will be quite energy efficient, not difficult to construct a water turbine, which allows for this to generate electricity. The movement of water in the channel because of the different heights of the Red and Mediterranean seas (Red Horizon above the Mediterranean at 9 m), is 1 knot (1.8 km / h) will be mixing of the water will the temperature difference and biological composition, which naturally attracts marine organisms, and fed them different species of fish. A huge attraction for the fish will appear with the advent of this new volume of water. Of course, all these business ideas need to connect the academic experts. I would not want to desire to get a lot of billions of dollars of profit in any way reflected in the deterioration of the ecology of the region. But populism in the evaluation of benefit - harm to the channel, may remove the very long term, if ever, a vital project. The examination must be thorough and scientifically sound. In the case of the project work of scientists - ecologists, hydrologists, ichthyology is for all time the existence of the navigable channel tightly linked to its exploitation. 3. In all schools to appoint teachers, prepared from citizens participating in the program developed countries, Arab and Palestinian descent. Specialists, vetted for loyalty to the participating countries, committed to the modern human values. corresponding to the best European standards. The vast majority of the Palestinian Authority, ultimately, evaluates the actions of Israel and the countries - participants, on in dignity.The vast majority of the Palestinian Authority, ultimately, evaluates the actions of Israel and the countries - participants, on in dignity. Dead Sea can imagine how - everything except a dead hard for him to submit. What is characteristic is the fact that it is sick. Human activities here were over half a century entails explicit consequences. The sea recedes at a dangerous pace, about 1 meter per year. Even remembering where beach bar located adjacent to the Hotel 10 years ago, shows that the level receded, but the depth has decreased by 10 meters. This is determined visually. Scientists of Israel, together with the Jordanian investigators are trying to identify the different phenomena that influence the Dead Sea and its region. The main problems facing the Dead Sea, due to increasing consumption of water in their homes, businesses and activities. But the main problem is the selection of water countries on whose territory the river runs. Jordan. As you know, the Jordan River Dead Sea helps to maintain your balance. Complicated problem and for large industrial plants that are in the south of the Dead Sea. On both sides of the border, the Israeli company Dead Sea Works and the Jordanian Arab Potash extract rare and precious minerals. In the cosmetics market as a small quantity of minerals mined in the Dead Sea. The problems of the water shortage in Israel have always been, but today this shortfall is most acute. Extraction of minerals in Jordan and in Israel, making a significant is contribution to the gross national product of both countries. Cease development at the Dead Sea is not easy. The Resort and recreational resorts of Israel at the Dead Sea, famous throughout the world for its unique natural mineral products, well are at a dangerous point of existence. The Israeli team of scientists conducting research, as we know, is developing a variety of plans to save the Dead Sea. One of the plans, which have begun to talk more about 10 years ago, involves the construction of a canal between the Red and Dead seas. Of course, the construction of the channel would be expensive, and, moreover, may entail a number of unknown effects that are associated with changes in the ecosystem. In the Dead Sea, the lowest point on earth, water gets through is specific flora and fauna, created in the process of mixing the waters of Lake Kinneret, which feed the Dead Sea, the small streams and seeps through the ground, rainwater. And of course, this flora has nothing to do with that which arises from the simple spillway of seawater into the Dead Sea. However, seem plausible that many, many years, the soil around the Dead Sea from - for all the above mentioned natural phenomena and human activities, more and more loses moisture, washed out and not filled. And in this connection I wish to recall that in implementing the project "Construction of the shipping channel in Israel" in the region will come about 6, 5 billion cubic meter water. This amount of water can not affect the improvement of ecology once desolate and arid parts of the desert Negev and the Dead Sea area. Vaporized, the water in the form of clouds, held by mountain range in significant quantities, condenses in the atmosphere, will continue to fall as Precipitation, previously absent in the area. Seeping through the earth strata, where there is sand, stone, clay, chalk and other components, the water will replenish underground reservoirs saline, fresh water. Vegetation along the canal will be capable of its root system to perceive the coastal moisture, which is typical for the coast all the oceans and seas. A person can accelerate greening of the region, by planting vegetation by artificial means. Abundance of sunlight in this area allows the use of a vast territory for the installation of solar power and get cheap desalination of sea water in quantities sufficient to irrigate the desert. And Caring for replenishing water from the Dead Sea scholars are controlled spillway water channel near the dam. Constructed there station laboratory will do this in evidence-based mode, through an artificially constructed body of water with desalinated water. If the volume of the reservoir spillway dam in the Dead Sea will be quite energy efficient, not difficult to construct the water turbine, which allows for this to generate electricity. Of course, all these business ideas need to connect the academic experts. I would not want to desire to get a lot of billions in profits earned by Israel since the start of operation of the shipping channel, in some way affected the deterioration of the ecology of the region. But populism in the evaluation of benefit - harm to the channel, may remove the very long term, if ever, a vital project. (Photo by Konstantin Guterman) The examination must be thorough and scientifically sound. In the case of the project work of scientists - ecologists, hydrologists, ichthyology be for all time the existence of the navigable channel tightly linked to its exploitation. Before drawing conclusions on the project, I have counted necessary to place on this page one more, very important information visually characterizing those many-sided options which are brought with itself by realization of the civil-engineering design of a ship canal in Israel. New territory is not a violent way. Even with the approximate calculation discharged from the construction of the channel, the volume of soil, one cannot but notice the possibility of its use (see calculations). Calculation of the volume of soil excavated above the water line. V(over)- The amount of soil excavated above the water channel. h - Height of soil above ground level, every 10 km of distance L.
excavated during the construction of the fairway. 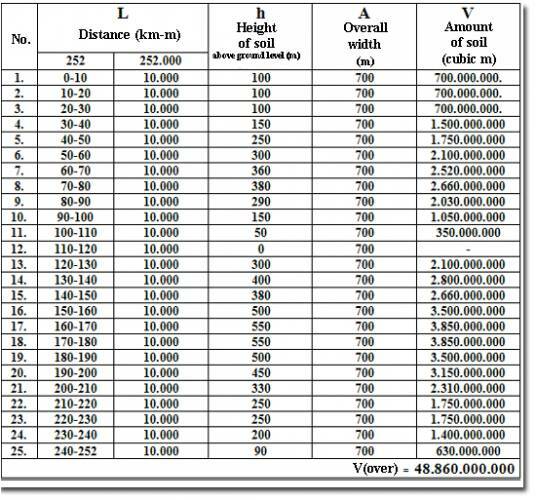 V(over) = 48.860.000.000 cubic m.
+ V(canal) = 6.300.000.000 cubic m.
V (Total) = 55.160.000.000 cubic m.
or = 55,2 billion cubic m.
Such a huge amount of redundant soil (stone, gravel) inadvertently leads to the thought: "And what to do with such a huge amount?" Following the logic of the Japanese living on the islands and permanently occupy the territory by sea, I made the calculations, ask yourself the question: "How to increase the area of the country if a large part of soil excavated during the construction of the channel, pour along the coastline of the Mediterranean?" volume of seawater in the western coastal belt of Israel.